The 1m Door Canopy from Greenhurst is lightweight, yet durable, providing cover from both sun and rain. It is manufactured from heat reflecting UV-stabilised tinted grey polycarbonate and features high impact-resistant side brackets in a choice of either white or black, giving it a modern, sleek design. 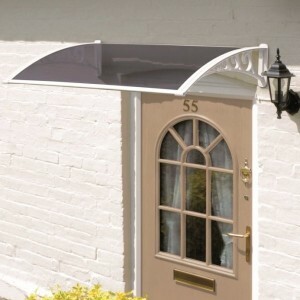 The door canopy also includes an aluminium front and rear profile with a rubber seal at the back ensure a secure fit. This attractive easy fit door canopy is an extremely cost effective and efficient way of providing shelter and protection from the British weather. A great way to protect yourself from a soaking when hunting for your house keys. Home assembly required. All fixing supplied.